It’s an unthinkable outcome, Reds. None of us would be able countenance the departure of Sadio Mané, least of all to Real Madrid, but Zinedine Zidane has been a long-term admirer of our star. Recent Spanish reports from El Confidencial suggest that any move to the Spanish capital would only happen if Mané declares his intention to leave Anfield. This is what it boils down to – it seems Mané will only leave Liverpool if he instigates the move by submitting a transfer request. It would take Countinho-esque act to do so and his performances, attitude, and the Reds’ prodigious ambition suggest that won’t happen. Carragher: “[I’d rather lose] Salah. They have the same amount of goals. I’m a massive fan of Mane. “Mane is the one that got Liverpool back. He was Klopp’s first big signing. He’s been there from the very start. We’re on the cusp of a winning the league title and still well-poised to possibly reach back-to-back Champions League finals, which is more than can be said for Real Madrid. Even if we were forced into selling the Senegalese sensation, the Spanish outlet have theorised it would take the princely sum of €150 million or more. El Confidencial also report that Zidane and Los Blancos are well aware that we sell high, having witnessed the exorbitant fee we got for Philippe Coutinho. With that in mind, Real have a two-pronged approach: go for both Mané and Paul Pogba as the deluxe option, or, the classic choice of long-term target Eden Hazard. The outlet suggests the former would require an outlay of at least €250 million for the double deal; of course, we recommend the latter. 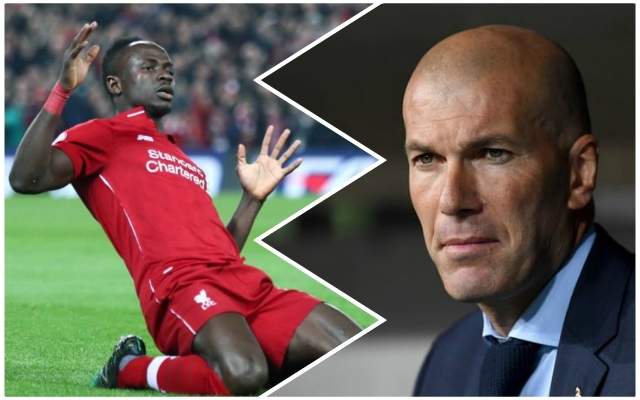 Why does Zidane want Mané so badly? Well, he saw first hand what a threat he is when Sadio scored against Los Merengues in last season’s Champions League final. Equally, he creates multiple opportunities for teammates without sacrificing the chance to score more than a fair few himself. Mané was attracting interest from Zidane before he left Real Madrid last summer too. Various reports, both domestically and in Spain, claimed the Frenchman demanded his signature. But, after the Champions League final, Zidane left the Bernebeu and took with him the possibility of bringing Mané into his fold. Julen Lopetegui sought other targets and the plan was ditched. With his arrival back in Madrid, the French manager is looking to rekindle the deal – but it feels like it will be a futile effort. If the La Liga side want Mané, the 27-year-old will have to tell Jürgen Klopp he wants to quit the club – surely he wouldn’t do that? Then, Real will have to shift out Gareth Bale as well as plus probably Toni Kroos and Luka Modrić. Sadio Mane scored 20 goals in 44 appearances for Liverpool last season. He already has 21 in 39 this season. The Senegalese is one of the world’s best attackers at the moment; with 21 goals, Mané has had his best-ever scoring season since coming to England. It stands to reason that Zidane would be enamoured with his goals, electric pace, and unpredicatablity. Having previously played on the right, Mané has flourished down the left since Mohamed Salah arrived. He even played down the middle in the 5-0 battering of Watford in March. This versatility and deadliness is what the French coach wants for his new revolution at Real. But, quite frankly, it’s unlikely to happen this summer with Mané signing a new 5-year contract last year and more than happy banging them in for us at Anfield.